Pamela Ramey Tatum is a full-time professional artist, painter of cityscapes, street scenes, landscapes, and portraits. Influenced and inspired by her artist/writer mother, Tatum grew up with a love for all things creative. At the age of 16 her talent was recognized, and she was selected to attend a magnet high school where she studied art. Tatum’s love of stories led her to earn a Master’s Degree in English Literature. And in her painting, she says that she is most interested in storytelling and also “rejoicing the miracle and wonder that life--every single breath of it--is. “ She wants to move the viewer emotionally, and to "have the viewer enter the story" she creates on canvas. 2012 began a new period in her work as she began painting with a knife using lots of paint to create fun, textured paintings. Her city scenes with “lovers under umbrellas” paintings were born. These have become her signature pieces and according to Tatum are her most popular work. In addition to her cityscapes, Tatum is also known for her portraits. She enjoys the opportunity to co-create with collectors who commission her to preserve their stories in a portrait or cityscape. It is not surprising that Tatum credits her influences as Monet and Van Gogh and all the impressionists whom she has studied. Her modern favorites include Jack Vettriano and Eugene Paprocki. Over the years Tatum has studied with many artists, including Morgan Samuel Price, David Gray, James Pratt, and Barbara Perrotti. For three years Master Artist, Robert Dorman was her mentor. Raised in Tampa, Florida, Tatum has lived and worked in New Smyrna Beach, Florida, since 2009. Her main studio since 2012 has been at The Hub on Canal, a 10,000 square foot, dynamic art space in New Smyrna Beach where visitors and collectors come from all over the world. As a world traveler, exotic locations seem to drive her passion and inform her work. She has lived, studied and worked in France, India, Israel and Poland. She has traveled also to Slovokia, Turkey, Greece, Egypt, and the Sinai. She also enjoys sailing in exotic locations with her husband. Tatum has won many awards in the Central Florida art scene. She also owned and operated a gallery for two years. Her primary focus now is on painting and exhibiting. She is also attending a month-long residency in Assisi, Italy, in summer 2018. With upcoming exhibits including one in Venice, Florida scheduled in 2018, Tatum continues to be added to private collections in the United States, Canada, and Europe. Tatum's work can be viewed at The Hub on Canal in New Smyrna Beach, FL, the Hyder Gallery in Lake Mary, Florida, and online at pamelarameytatum.com. Framed print of lovers walking under umbrella in Paris rain. Height 11" x Width 14" x Depth 0.3"
This painting was my first knife painting with the lovers under an umbrella. It sold right off my easel and its my most popular print. Pamela Ramey Tatum Professional Artist Pamela Ramey Tatum is a full-time professional artist, painter of cityscapes, street scenes, landscapes, and portraits. Influenced and inspired by her artist/writer mother, Tatum grew up with a love for all things creative. At the age of 16 her talent was recognized, and she was selected to attend a magnet high school where she studied art. Tatum’s love of stories led her to earn a Master’s Degree in English Literature. And in her painting, she says that she is most interested in storytelling and also “rejoicing the miracle and wonder that life--every single breath of it--is. “ She wants to move the viewer emotionally, and to "have the viewer enter the story" she creates on canvas. 2012 began a new period in her work as she began painting with a knife using lots of paint to create fun, textured paintings. Her city scenes with “lovers under umbrellas” paintings were born. These have become her signature pieces and according to Tatum are her most popular work. Pamela’s palette knife technique is bold and confident, and there is a passion and energy to her work. The vivid colors add to the dynamic element and the mood of her work. 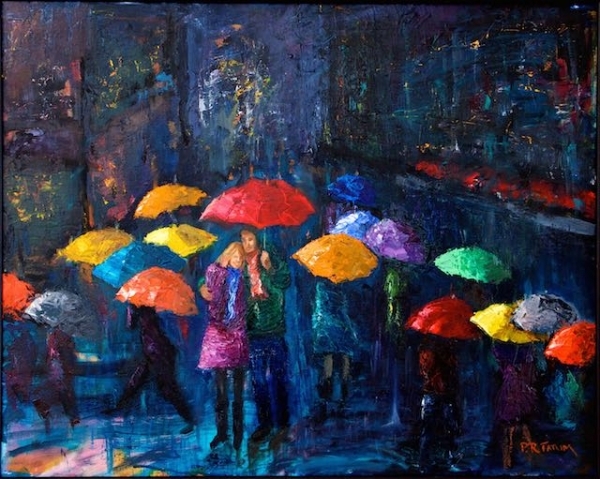 She believes it is the juxtaposition between the rain (associated with sadness) and the bright colors and lovers (associated with happiness) that is the appeal of these paintings. She explains, “I think these paintings speak to the subconscious and its desire to overcome loneliness, to connect with another human being in the face of all the darkness and sadness in the world.” In addition to her cityscapes, Tatum is also known for her portraits. She enjoys the opportunity to co-create with collectors who commission her to preserve their stories in a portrait or cityscape. It is not surprising that Tatum credits her influences as Monet and Van Gogh and all the impressionists whom she has studied. Her modern favorites include Jack Vettriano and Eugene Paprocki. Over the years Tatum has studied with many artists, including Morgan Samuel Price, David Gray, James Pratt, and Barbara Perrotti. For three years Master Artist, Robert Dorman was her mentor. Raised in Tampa, Florida, Tatum has lived and worked in New Smyrna Beach, Florida, since 2009. Her main studio since 2012 has been at The Hub on Canal, a 10,000 square foot, dynamic art space in New Smyrna Beach where visitors and collectors come from all over the world. As a world traveler, exotic locations seem to drive her passion and inform her work. She has lived, studied and worked in France, India, Israel and Poland. She has traveled also to Slovokia, Turkey, Greece, Egypt, and the Sinai. She also enjoys sailing in exotic locations with her husband. Tatum has won many awards in the Central Florida art scene. She also owned and operated a gallery for two years. Her primary focus now is on painting and exhibiting. She is also attending a month-long residency in Assisi, Italy, in summer 2018. With upcoming exhibits including one in Venice, Florida scheduled in 2018, Tatum continues to be added to private collections in the United States, Canada, and Europe. Tatum's work can be viewed at The Hub on Canal in New Smyrna Beach, FL, the Hyder Gallery in Lake Mary, Florida, and online at pamelarameytatum.com.